Naturally blue sodalite is named for its sodium content, and it may be classed as a feldspathoid in mineralogy. 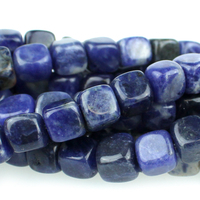 Found predominantly in Canada and in other small pockets around the world, these beads are made from sodalite that was mined in Africa. 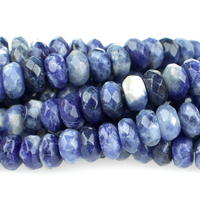 This gemstone is sometimes mistaken for lapis stone. 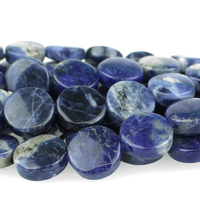 Metaphysically, sodalite is said to increase one's confidence, enhance creativity and to have a balancing effect on emotions and one's mental state. This gemstone is also said to enhance self expression and communication, eliminate confusion, bring peace and facilitate spiritual growth. Sodalite 10mm round blue New! Sodalite 10 x14mm flat oval blue New! Sodalite 12mm coin blue New! Sodalite 12mm square blue New! Sodalite 30mm coin blue New! 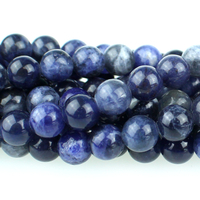 Sodalite 4mm round blue New! Sodalite 6mm round blue New! Sodalite 7mm cube blue New! Sodalite 8mm faceted rondell blue New! Sodalite 8 x 10mm nugget blue New! 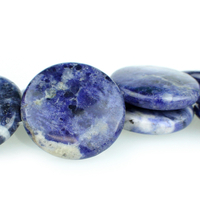 Sodalite is naturally denim blue with veins of white and mottled splotches of black and grey. This texturally interesting stone is said to bring inner peace and endurance - something we could all use a bit more of! 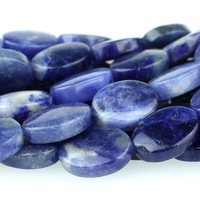 Sodalite was originally discovered in Greenland in 1806 and large deposits were discovered in Ontario, Canada. On a visit to Ontario, Princess Patricia of England chose sodalite for the interior decoration of Marlborough House in England, and hence Princess Blue became the alternative name for this stone.